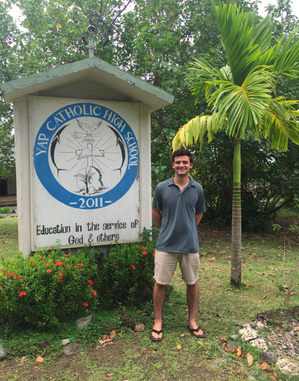 "My decision to teach at Yap Catholic High School was one of the best choices that I ever made. The natural beauty of the island, traditional culture, and exceptionally kind people are rare, but the school itself is one-of-a-kind. Yap Catholic High School fosters a supportive community that is truly unique. YCHS promotes strong lessons about hard work, faith, respect, service, health, and sustainability inside and outside of the classroom. Although I was a teacher, I learned so much about the world and about myself during my year of service. I feel lucky that I was able to spend a year in such a genuinely remarkable place! "I had a fantastic experience teaching at YCHS. I came in with no significant teaching experience and was initially somewhat intimidated by my responsibilities. But with the guidance of the school’s senior staff and their encouragement to try new strategies in the classroom, I felt that I made significant strides over the course of the school year. The school is unique because of its strong relationship with the larger community of Yap. The students and their families made me feel welcome at all times, making sure that I was able to truly learn about the island’s culture and history during my time there. The school’s rapid growth—in enrollment, reputation, and alumni reach—is a testament to the coordinated hard work of the students and the school’s permanent faculty." "Mogethin! Yap, Micronesia is an absolutely beautiful place to live, and an even better place to work. When I first got here, I was greeted by gecko sounds and morning rooster wake-up calls. These sounds were a bit unfamiliar at first but became a comfort that I now miss – just like everything else in Yap! Whenever I wasn’t teaching, coaching, or goofing about with the students at YCHS, my fellow volunteers and I did everything we could to soak in as much of Yap as we could 😊 There’s nothing better than a fresh coconut with Tuna poke from Mnuw after a long day at school – the fish doesn’t get fresher from this restaurant on the water! There may not be a public gym on Yap, but the mile swim from the hospital to O’Keefe’s island does the trick; and the variety of life living in the coral reef below is an added perk. 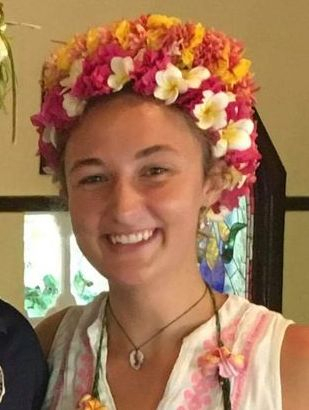 The rest of my free time was spent spending time in my village; playing with baby Zeke and his siblings, learning how to make nuw-nuws, learning how to husk a coconut, and spending time at the Church for get-togethers and activities! 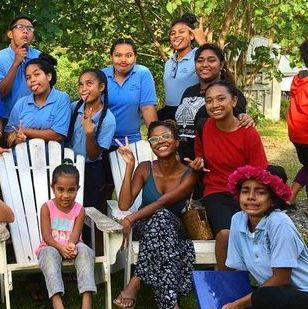 I could go on-and-on about my time in Yap – the places I’ve visited, the wonderful people I’ve met, and the tremendous personal growth I’ve gained – but I don’t think there’s enough space on this web page for that!" If you are interested in learning more about our past volunteers' experiences, reach out to us at volunteers@ychs.net and we will get you in touch with them directly so that they can answer any of your questions.